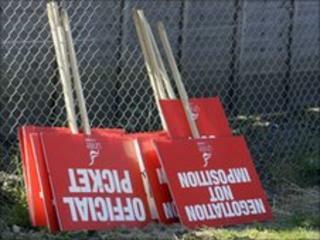 The government has slapped down calls by business leaders for changes to rules regarding strike ballots. The CBI wants amendments to outlaw industrial action going ahead on a "relatively small turnout". It said a stoppage should only go ahead if 40% of the balloted workforce supported it, not only a simple majority among those who actually vote. But Prime Minister David Cameron's official spokesman said there were "no plans to change strike legislation". Meanwhile, general secretary of the TUC, Brendan Barber said the UK already had "some of the toughest legal restrictions on the right to strike in the advanced world". The CBI said strikes should require a higher level of support from workers because of the damage they caused to economic growth and the inconvenience they caused the public. "Strikes cause misery. They prevent ordinary people going about their daily lives, whether it's getting to work or getting the kids to school," the group's deputy director general John Cridland said. "Strikes also cost the economy dearly and undermine our efforts to help rebuild the economy. That is why we believe the bar needs to be raised." The TUC's Mr Barber said that it was already for courts to "strike down democratic ballots that clearly show majority support for action". "The number of days lost to industrial action is historically low and less than in many other countries," he added. "Any further restrictions would be extremely unfair and almost certainly breach the UK's international human rights obligations. "The CBI seems to think human rights stop at the workplace door." Do we still have a right to strike?